Going through KNUST’s Research Report for 2015 and I must congratulate the team that put this maiden publication together. It is very well designed and information flows logically. The report showcases some of the university’s research and development outputs and how such activities are impacting the ordinary man on the street. These take the form of technological inventions, scientific theories, contributions to knowledge and the literature, creative arts, religious enlightenment, health sector transformation, agricultural innovations, computer software development, sociological interventions, etc. Going through the report, I noticed that the list of research projects are interesting and have direct impact on the communities and economy in general. But most of these are funded by Donor agencies. Isn’t it time we seriously considered setting up our own fully-funded National Research Councils (NRCs)? Also more crucially, the university needs to reform its Research and Business Development Units (BDUs) to support active commercialisation of research projects. It needs to recruit sharp brains and provide them the impetus to churn research into profitable commercial ventures in partnership with industry. The university should find some innovative means to channel some of the monies from the cash-spinning programmes like the MBAs and medical degrees into other faculties like Engineering and the Sciences. 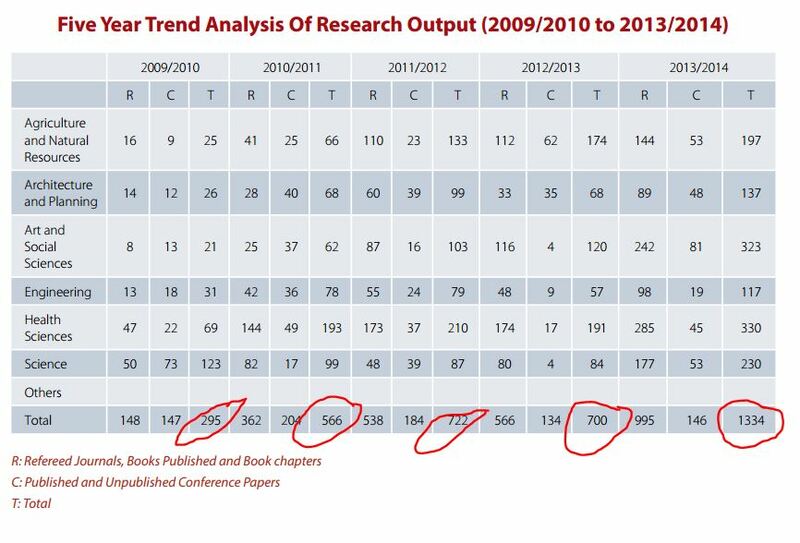 Overall research output has increased almost five-fold over five years. However staff publication from the College of Engineering hasn’t been that great. 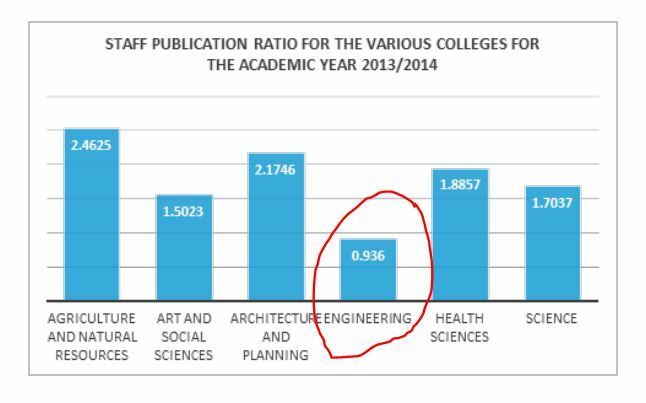 The College of Engineering only published 1 paper per lecturer in 2013/14 academic year as compared to almost 2.5 and 2 publications per lecturer in the College of Agriculture and Natural Resources and the Architecture and Planning respectively. Finally, it will be interesting to compare KNUST’s research output to other universities and colleges in Ghana and Africa as a whole. Kudos to the KNUST Team!